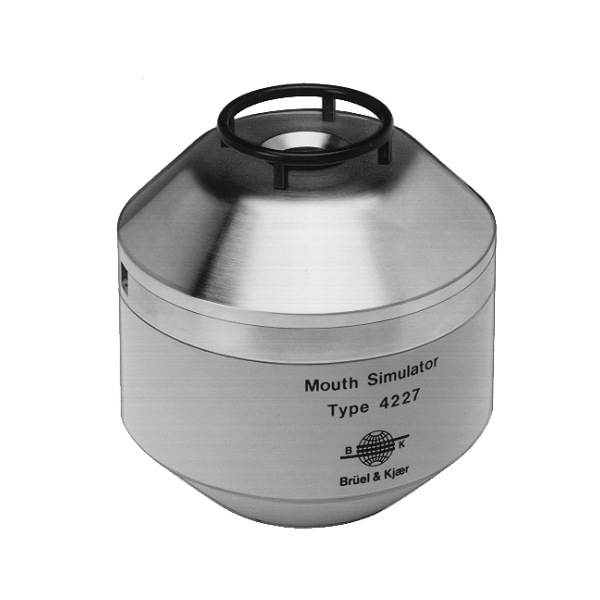 Brüel & Kjær Mouth Simulator Type 4227 is a stable, low distortion sound source used for the testing of acoustic transducers. When testing telephone transmitters and close talking microphones it is required that the sound field closely replicates the sound field generated by the human mouth, as specified in IEEE 269. Type 4227 fulfills this requirement. Calibration of 4227 can be made with the aid of the Calibration Jig UA 0901 provided. The jig is designed to hold a 1/2″ measuring microphone at a distance of 25 mm from the lip ring (see Fig. 1.). It consists of two interlocking plates which can be fitted together in two ways enabling the microphone to be held with its axis at either 0° or 90° to the mouth axis.